D.C. Might be small, but it seems to stand large in terms of gin. We’ve talked at length about New Columbia Distilling’s fine line of gins. And last summer we reviewed One Eight Distilling’s flagship Ivy City Gin. And we quite liked it. So of course, I’m excited to try their new barrel aged offering, Untitled Gin No. 1, which rests Ivy City gin in former bourbon barrels for between 3 and 10 months. The higher end of that range is on the higher end of the range for many barrel aged gin makers, with somewhere between three and six being the norm, and those that do longer, similar here, do usually a bit of blending to achieve the signature balance of lightness and oakiness that makes for a good barrel rested gin. For more on the “base gin,” check out Gold Medal winning review of their Ivy City Gin. For here, we’ll focus on the differences that make their Untitled Gin* stand out. The nose seems a radical departure, mellower and more somber. The spice is noticeably subdued, although composed of similar notes. Gentle, pepperkakor tinged with a hint of oak, ginger, pine bough and lemon zest. Lovely, and inviting, but seemingly more comfortable in its shoes than the nose of the original. Once you sip, the palate is long and multi-faceted. It’s one of those gins that unravel before you, revealing multiple faces, especially neat. It begins somewhat quiet, with juniper and a similar peculiar pepper-like spice that tastes somewhere between cubeb and grains of paradise (I’m supposing this might be spicebush, but outside of Ivy City gin, I don’t know it as well), before lemon and eucalyptus-like camphoraceous notes emerge. The oak is most pronounced later on the palate, coming through with a crisp woodiness and not as much vanillin as other aged gins seem to have. A residual dry character highlighted by pepper and juniper with a slight hint of anise becomes more peppery and pine like as the spirit dries out. There’s plenty of juniper in the mix, which mixes lovingly with the other botanicals. Overall, it’s crisper and brighter than their flagship Ivy City gin. The barrel adds a nice oakiness towards the finish. I find it a bit light on the creamy vanilla notes that other barrel aged gins put at the fore. The oak and wood touches are nice, and it’s clear that the aging process does some nice work on the overall botanical mix. 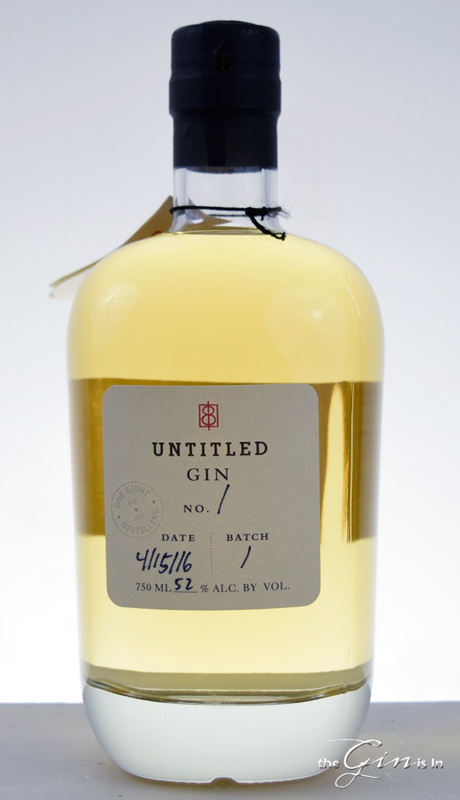 Fans of the style might find Untitled Gin No. 1 a bit more skewed towards some of the “young whiskey” notes that were especially common among some of the early 2010 aged gins. That being said, I think there’s a lot to like here. Fans of cocktails and mixed drinks with their aged gins will find the assertive 52% ABV and bright gin flavor a welcome departure from some of the other aged gins on the market. Untitled Gin No. 1 mixes beautifully. It’s a good old fashioned with some cherry bitters, but it’s an even better Negroni mixed at the classic equal parts ratio (this is what 52% gets you). It mixes nicely with Dry Vermouth as well, and though some will decry a golden hued Martini as “blaspheme,” I say “have a sip before ye judge.” It’s a good cocktail and worth taking a closer look at. This might be one of the first aged gins that I really liked in cocktails across the board as much as I liked it neat. Untitled Gin No. 1 is an exciting aged gin that fans of both contemporary spice-leaning gins and classic gins will find things to like about. It mixes as well as it sips neat; wearing its aging on its sleeve, the wood acts almost as much as a botanical as a compressor for the botanical mix. And at 52%, it comes in at the high end among aged gins, which makes it versatile and able to be enjoyed on the rocks without losing its distinctive character. As I began the article with, I think Washington D.C. has quickly become one of the epicenters of ginnovation** in the United States and the latest from One Eight Distilling does nothing to dissuade me of that notion. In fact, it confirms it. *Why Untitled? Perhaps as an homage to the fact in the United States you can’t place an “age statement” on a bottle of gin, nor can you really even use the words “barrel aged.” Though that’s what we often say here, the term “barrel rested” seems to be best tolerated by those in charge of labeling. Though note, this isn’t legal advice to would-be-barrel-aged-gin-distillers. **Even I’m not immune to a bad gin pun.